At long last, maverick UK death metallers SCYTHIAN are set unleash a storm: Hubris in Excelsis, the band’s highly anticipated second album. 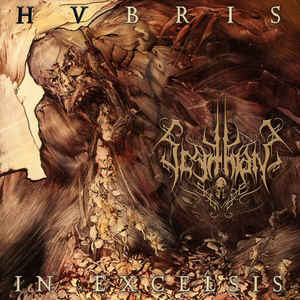 SCYTHIAN’s first album for HELLS HEADBANGERS – and the first UK band to be signed to the label – Hubris in Excelsis marks the transformation of a little-known quartet into a serious contender. Categories: DISTRIBUTION, DISTRO STORE, Vinyl_Corner, VINYL-Distribution, VINYL-RECORDS. Tags: Death Metal, Hells Headbangers ‎. Heavily inspired by apocalyptic science fiction, morbid poetry, and the unlikely mix of Sodom, Bathory, and Angelcorpse – or perhaps more specifically, INRI-era Sarcofago, ’90s Zemial, and Desaster’s Tyrants of the Netherworld – here on Hubris in Excelsis, SCYTHIAN better the bold sound & vision triumphantly displayed across their celebrated debut album, 2009’s To Those Who Stand Against Us, whilst retaining the unique, charismatic core that won them favor ‘n’ fervor in the international metal underground. From slow-burning beginning to bloody, battle-torn end, SCYTHIAN fire off ten, total-experience epics that are as engaging and invigorating as the last: almost narrative despite the hellfire and fury with which SCYTHIAN play, yet winding through a wide range of dynamic contours and subtly dusted with tasteful nuance.